By the time 2006 rolled around, the James Bond franchise had found itself in somewhat of a rut. Financially, it was doing as strongly as ever, but creatively Eon Productions seemed to be running out of ideas during the late ’90s and early 2000s. Poor Pierce Brosnan wasn’t consistently given capable scripts to work with, and much of the charm of his performances owes more to him than the rest of the movie. Longtime producers Barbara Broccoli and Michael G. Wilson needed to shake things up to drum up any significant interest, and luckily that opportunity came when the rights to Ian Fleming’s first Bond novel, Casino Royale, became available at long last. With Brosnan gone, it was also time for another actor to bring the British spy to life for a new age. The casting of Daniel Craig certainly raised eyebrows for multiple, superfluous reasons: he’s blonde, he’s too short, etc. However, I can imagine that those naysayers were silenced within minutes of seeing the finished film. In fact, Casino Royale opens with arguably the best pre-title sequence in the entire series. Stylish and cool but terse in the execution, it’s a smack in the face to the ludicrous excesses of the previous movies. I can remember being in the theater November 2006 and feeling completely blindsided and shocked as Bond beats up his target with fierce verve and then attempts to drown him in a bathroom sink. With its alternately beautiful and gritty cinematography, this sequence could easily be mistaken for an adaptation of a Bond short story had Fleming written one like this. As a part of the larger whole, it is a signal for things to come. The killing of this man and his contact gains Bond his license to kill, and the trademark series gun barrel is perfectly placed right before Chris Cornell’s credits song, “You Know My Name,” a song I initially wasn’t too hot on but has grown in stature for me in the years following. It is a decidedly different kind of Bond song, one that is more in line with Cornell’s alt rock roots rather than the ballads or belters from previous movies. The reinvention of the series continues with the villain Le Chiffre, who is less grandly fantastical and more scarily sinister in the vain of previous straightforward Bond villains such as Scaramanga and Red Grant. Le Chiffre wants to destroy the world like any other Bond villain, but this time it is more about financing terrorism rather than blowing up nuclear bombs to start World War III. And with the exception of the character’s bleeding eye (because every Bond villain needs to have some weird quirk), Mads Mikkelsen remarkably underplays Le Chiffre’s menace to creepy effect, rather than going for the hammy theatrics a la Orson Welles in the Casino Royale 1967 parody. When we first meet Le Chiffre, it is not in an underground lair, but in the jungles of Africa where there are children brandishing assault rifles within a terrorist cell. But this doesn’t mean all the villains are completely down-to-earth, as we see in the now-famous sequence where Bond is tracking down one of Le Chiffre’s bombers in Madagascar. The extended chase that follows is unlike anything we have seen in a Bond movie, or really any Hollywood movie, before, infusing what could have been a standard foot chase with the parkour theatrics made famous by the French action film District B13. It is also a neat way of expressing Bond as a neophyte 00 agent, contrasting the bomber’s acrobatic prowess with Bond’s clumsy and blunt maneuvers, best exemplified when the bomber swings over a piece of drywall and then Bond simply plows right through it. In Casino Royale, he is not yet completely the suave, smooth spy that we know him as, and the film does its best to show him as a blunt instrument not yet refined by years of experience. While the parkour chase is the undisputed highlight of the action scenes here, director Martin Campbell (reviving the series a second time after his franchise-saving Goldeneye 11 years prior) doesn’t want to give up on topping that, as the car chase around an airport shows with its close-call stunt work and echoes of the famous Raiders of the Lost Ark truck chase. Ironically, for an action blockbuster, this first act is the extent of the big action set pieces we will see until the very end, and Casino Royale takes the risky chance of crafting a plot where Bond is playing cards most of the time rather than shooting bad guys. If the first act was a showcase for Campbell’s direction, then the majority of the credit for the rest of the film goes to returning franchise screenwriters Neal Purvis and Robert Wade, along with some help from Oscar-winner Paul Haggis. 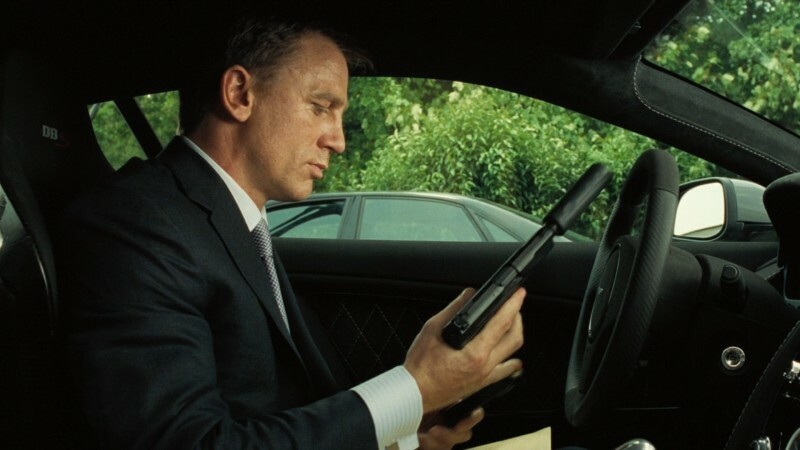 This is first evident in the scenes between Bond and M, where the dialogue has a bite and edge (and funny edge, too) between them that has not really been seen in the series until now. The mother-son dynamic adds a new layer to their relationship, and would continue through the next two Daniel Craig Bond movies Quantum of Solace and Skyfall. 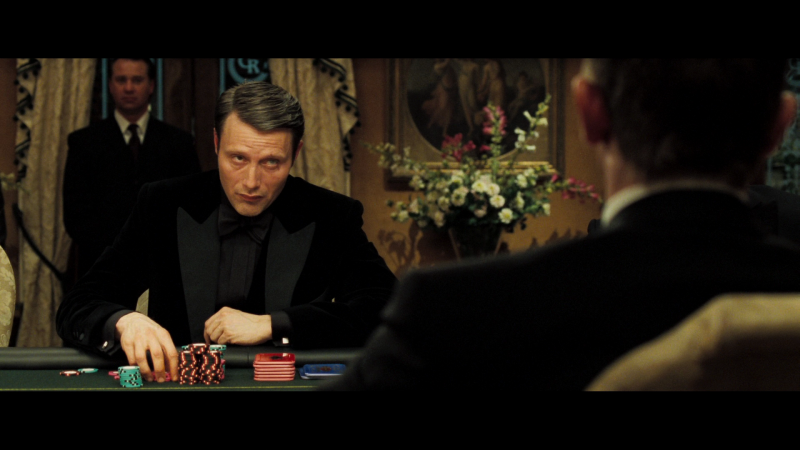 Once the poker playing starts, where Le Chiffre is attempting to gain back his money after Bond sabotaged his operation earlier, the pointed dialogue from Haggis and co. in conjunction with Campbell’s drawn out moments of silence creates suspense out of very little. To spice things up, there are a couple of scrapes with death sprinkled into the game, too, notably one where Le Chiffre poisons Bond’s famous vodka martini and he uses the only real gadget in the film—a first aid kit in the trademark Aston Martin. There are no ejector seats or jetpacks tucked away in this slick ride. The introduction of Vesper Lynd represents another forward step for the series: a Bond girl who would rather throw his wit back in his face than succumb to his charms. Playing the role less like Honey Ryder and more like Tracy Draco, Eva Green exudes both beauty and confidence, along with a dash of inner conflict, something rarely seen before in a female lead from a series that often leaned on sexist tendencies. The scene where she takes a shower to wash away the blood from a fight is surprisingly tender, providing an emotional backbone to an otherwise hard-edged action thriller. When taking into account the plot developments that come later on, the importance of this scene is heightened even more. Following one of the most intense and painful-to-watch torture scenes I have ever encountered, the third act takes even more of a gamble than the poker-heavy second act—the pacing slows even more. It is a very strange structure for an action movie (and Bond movie) to take on, throwing you into the chaos at the start and then easing down instead of building towards a grandiose climax. Thankfully, the affecting and bittersweet conclusion that it comes to is worth the wait, and repeat viewings adjust the viewer to the unusual pacing framework further. The impact that Casino Royale had on the franchise was so strong, in fact, that Daniel Craig was immediately considered the best actor to play James Bond since Sean Connery, and I would have to agree with that. Craig takes the vulnerability of George Lazenby and the bitterness of Timothy Dalton, and then juices it up with an understated sense of Brosnan humor and cool to balance out his rough features. The lack of series mainstays Q and Moneypenny (although she gets a little shout out in one scene) is hardly noticeable here, as stripping 007 down to his basics was something that had to be done after 20 movies that cannibalized the same formula to the point of parody. Casino Royale is an energized adrenaline shot in the arm that has rightfully earned its place among the best of the entire James Bond series, and will hopefully remain a blueprint for film reboots in how to respect decades-old tradition and mix it with modern vitality.